I bet you didn’t realize .name existed, eh? That’s right, I have my very own domain, registered with directNIC and hosted by Dreamhost. I’m still using WordPress software for my blog (which I highly recommend), but now I have full control over it. I’ll eventually redesign my blog so that it fits with the rest of my personal web site. But that means I need to learn how to create WordPress themes, which isn’t a one-hour job. But otherwise, it’s good to go. There are holes where you wouldn’t expect*, and there is no single edition that contains every Office program. 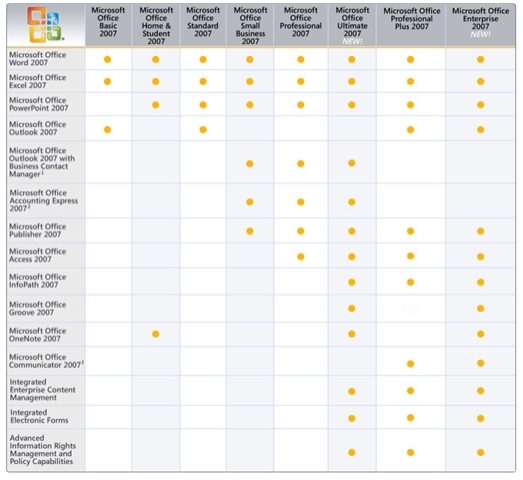 Office Ultimate lacks one program — how is that “ultimate”? I understand the theory of market segmentation, but there’s also the reality of human confusion. So I’m going to start using people’s first names in some circumstances. For example, “Entertaining visitors to the Bay Area” is now “Matt and Laurel’s visit”. It makes more sense to me and to those who know them, and those who don’t know them don’t care anyway. I’m still not using last names, nor am I tagging photos with people’s names. I’m curious to see how people’s privacy expectations online will evolve. They’re generally willing to put up a lot of information without much thought as to who can see it. For example, at CSCW I saw a talk by Cliff Lampe, a Michigan State professor, who said he announced to his class that he had read all of their Facebook profiles, and that you could see each student mentally going through what they had put in their profiles and their resulting grimaces. Here’s a “kinetic art movement” project by Tim Fort. It’s way more than dominos. (Thanks to Clemens.) Reminds me of the Honda “Cog” commercial. See Sacha Baron Cohen (of Ali G and Borat fame) like you’ve never seen him before: normal. I was intrigued by the music in the TV commercial for “Gears of War,” an Xbox 360 game. The song is “Mad World,” sung by Gary Jules for the movie Donnie Darko. And it turns out that the song is originally by Tears for Fears. Another melancholy song: “Missing” by Everything but the Girl is one of my favorite songs from the 90s. Ever since I’ve been uploading my photos to Flickr in June, I’ve blogged a lot less often. I guess I can only devote so much attention to any online activity. Out of the 21 people who list me as a contact, I don’t know 1/3 of them. It’s flattering, but also a little eerie. It also took a while to get used to random people leaving comments and marking my photos as their favorites. But those things keep encouraging me to take and post more and more photos, since I know someone besides me appreciates them. There might be other online photo albums that have certain features that are better, but one of the biggest reasons I stay on Flickr is network effects — my friends are also on Flickr. I’ve realized that I’ve been blogging a lot less ever since I started posting my photos on Flickr. Seems like I can do only so much “content creation” before maxing out.